To celebrate the new pandas that came to 上野動物園 (Ueno Zoo) in Tokyo last February, the design of the public mailbox just outside the zoo has been changed to resemble a panda starting today. The mailbox even has "panda ears" and a "panda tail". 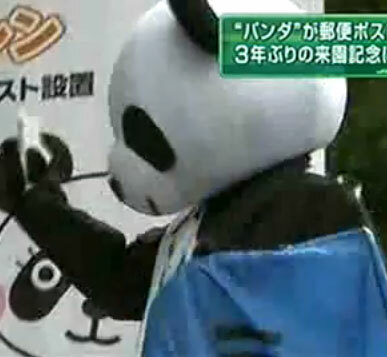 To publicize the new 「パンダポスト」 (panda mailbox), the zoo had a ceremony with children from a nearby 幼稚園 (pre-school) drop postcards into the mailbox after which a “panda postman” came to collect the cards. Many Tokyo TV stations had news crews there to film the ceremony. You can see the kids from the pre-school putting their postcards into the mailbox. But, as is Japanese manners, the first child says 「パンダポストマンさんよろしくお願いします！」…which isn’t easy to translate into English, but it’s close to “Thank you, Mr. Panda Postman!“. All mail deposited into this “panda mailbox” will be delivered with a special panda postal cancellation mark over the stamp. The zoo is hoping that many people will make a special trip to mail letters from this mailbox…and then visit the zoo. It is now summer vacation in Japan. Many people, especially families and couples, like to visit places such as amusement parks and zoos during this time. 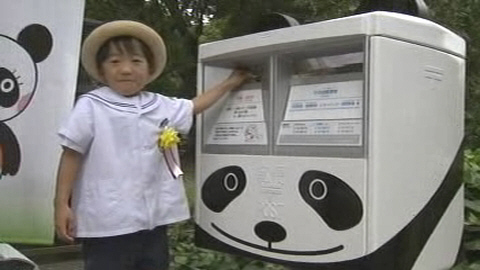 And also, many people in Japan send 「かもメール」 (summer postcards) to friends and relatives…and I’m sure many people will use the panda mailbox to send them from now. Do you know the “Ad Council“? If you’re not American, you probably don’t. Even if you are American, you may know their TV ads but not recognize the name. The Ad Council puts public service commercials on TV. Not trying to sell anything…just addressing a problem in society. When I lived in America, their most well-known commercials were probably the “Crash Test Dummies” that were used to try to convince people to fasten their seat-belts when they were in a car and anti-drunk driving ads with the catch-phrase “Drinking and driving can kill a friendship“. The Ad Council is in Japan as well. Here it’s called 「社団法人ACジャパン」 (“AC (Ad Council) Japan Association“). The ads by AC Japan are quite different from America’s Ad Council commercials. Rather than car safety the ads here mainly focus on manners. If you’re in Japan now and you watch Japanese TV you’ve surely noticed that ever since the 2011 March 11 earthquake the commercials on TV here have been almost exclusively AC Japan ads. This is because it would considered poor taste and a bit rude to show commercials for beer, fast-food, cars, or other materialistic goods when so many people in 東北地方 (the Tohoku Region) have lost so much and are in need of basic necessities. So, to fill the time spaces in pre-recorded TV shows that are normally for commercial ads…all of the TV stations in Japan put messages from AC Japan in their place. The ads extol the virtues of reading, recycling, and being polite. They also have one titled 「魔法の言葉で」 (“The Magic Words”). Not easy to explain, but this ad has characters named after some basic Japanese “magic words” of basic manners. The names are a play on words in Japanese…but when translated into English, the word-pun is lost. See? The names are cute play on words in Japanese…but kinda odd in English. Besides these TV ads in place of regular commercials, other noticeable differences in Tokyo since the disaster of March 11th are shops opening later and closing earlier everyday…and using only the bare minimum of lighting necessary. All shops and places of business are doing it. This is to conserve electricity since the nuclear power plant disaster. It’s a bit surreal to see the usually well-lit and neon Tokyo nights so dark these days. Also, the trains in Japan usually have poster ads on the walls and hanging from the ceiling…but, for the same reason as the eliminated TV ads, these days the trains have very few poster ads. But soon, I’m confident, Japan will be back to normal. 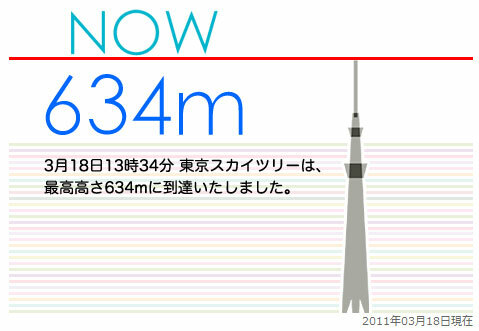 On the news today they said that the construction of the 東京スカイツリー (Tokyo Sky Tree) reached a height of 634 meters tall at 1:34PM this afternoon. That means that they are finished building it upwards because it was designed to stand at 634 meters tall. This height was decided upon for two reasons…first, it is now the world’s tallest free-standing tower, and also in Japanese “6-3-4” can be pronounced as “Mu-sa-shi” which sounds like 「武蔵の国」 (“Musashi“) which is the old name for the area of Tokyo that the towers stands in. Even though the Tokyo Sky Tree now stands at it’s full height, there is still construction yet to be completed on the tower which isn’t scheduled to be completed until sometime in 2011 December. The tower is due to open to the public in the spring of 2012. Last October, they did a test of the tower’s lighting, so we had a preview of what the Tokyo Sky Tree will look like when it’s illuminated every evening. Click here to see the post I wrote with a few photos of the lighting test and a preview of what it’s expected to look like completed and illuminated. It’s now 2:47PM on Friday, 2011 March 18th. 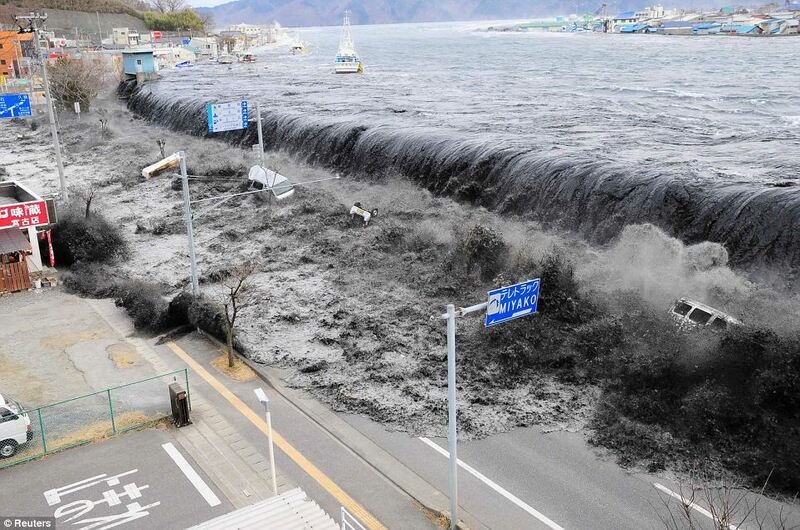 The biggest earthquake in Japan’s recorded history struck at 2:46PM on Friday, 2011 March 11th…exactly one week ago. I wrote this post at 2:47PM and not at 2:46 (the time the ‘quake struck) because at 2:46PM, all of Japan offered one-minute of silence to honor the victims of the tragedy. It’s one week later and of course too soon for there to have been much significant improvement or recovery from such a major disaster. 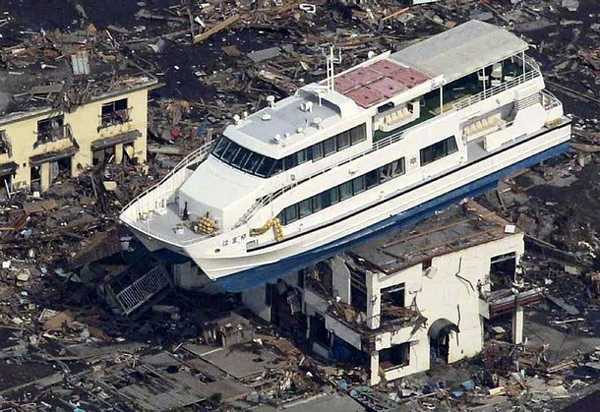 Boat left on a house by the tsunami. Between the search for survivors, rebuilding the intensely damaged areas, and getting the nuclear power plant back under control…Japan is facing a huge challenge. All the while earthquake aftershocks are still occurring…even down here in Tokyo. But I’m confident life will be back to “normal” soon enough. Do you know who 岡本太郎 (Taro Okamoto) was? 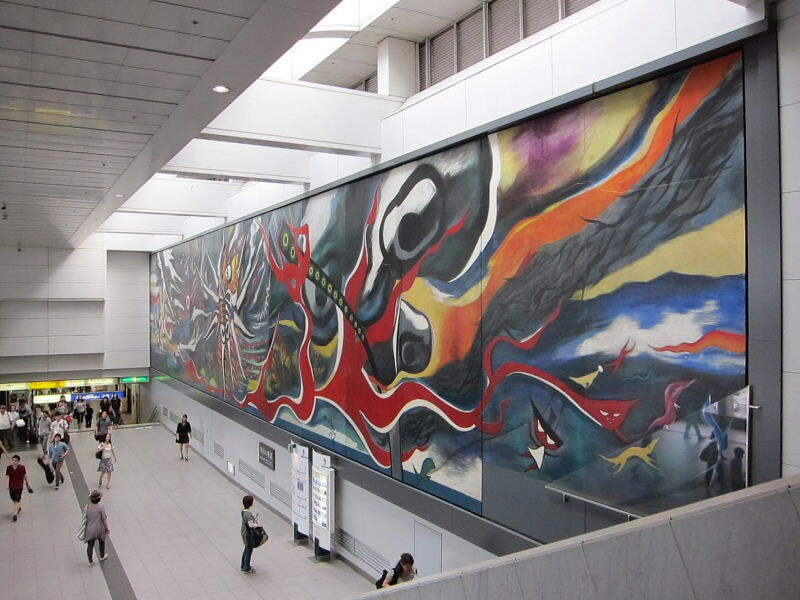 He was a Japanese abstract artist and sculptor. He is quite famous in Japan. 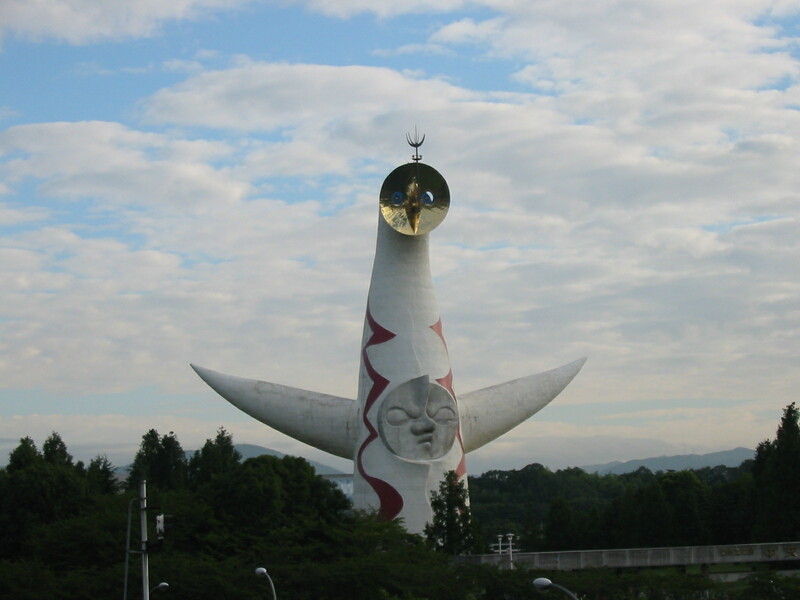 His most well-know piece is probably the huge sculpture that he made for the “World Expo ’70” in Osaka titled 「太陽の塔」 (“Tower Of The Sun“). It still stands at the site of the expo in Osaka. 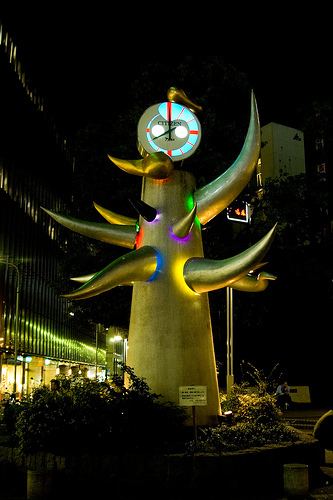 I haven’t been to the “Taro Okamoto Museum” but I have seen three of his pieces many times…because these three pieces are displayed in public here in Tokyo. The 「子供の木」 (“Children’s Tree“) which stands in front of the 「子供の城」 (“Children’s Castle“), which is a fun, educational activity-center for young children in Tokyo. 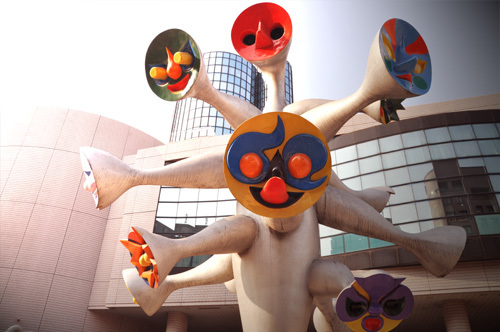 I took my children to this place a few times when they were young and I saw this sculpture in front of the building. I knew immediately that it was by Taro Okamoto because it matched his distinctive style. And I’ve also seen his painting titled 「明日の神話」 (“Tomorrow’s Myth“). This painting is Mr. Okamoto’s depiction of the atomic bombing of Japan in World War II. This painting had been in Mexico for about thirty years and was only returned to Japan a little over two years ago. It’s now on display inside 渋谷駅 (Shibuya Train Station) in Tokyo. 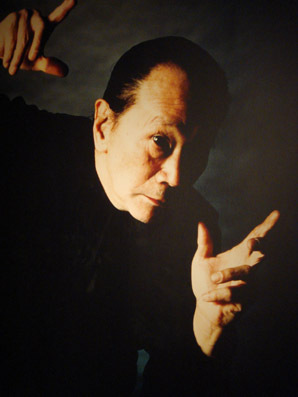 Well, if 岡本太郎 (Taro Okamoto) was still alive he would be 100 years old today. I learned that today is the 100th anniversary of his birth when I accessed the Google search engine earlier today and noticed that the logo looked like Mr. Okamoto’s artwork. Google's logo to commemorate Taro Okamoto's 100th birthday. I wrote a post about how, for many people in Japan, “Christmas dinner” = Kentucky Fried Chicken. It’s been that way for years. And I also wrote another post about how McDonalds in Japan is offering a special chicken meal set for Christmas this year in attempt to take some of the lucrative X-mas chicken-dinner market from Kentucky Fried Chicken of Japan. Well, it seems that Burger King Japan has decided to jump on the bandwagon. 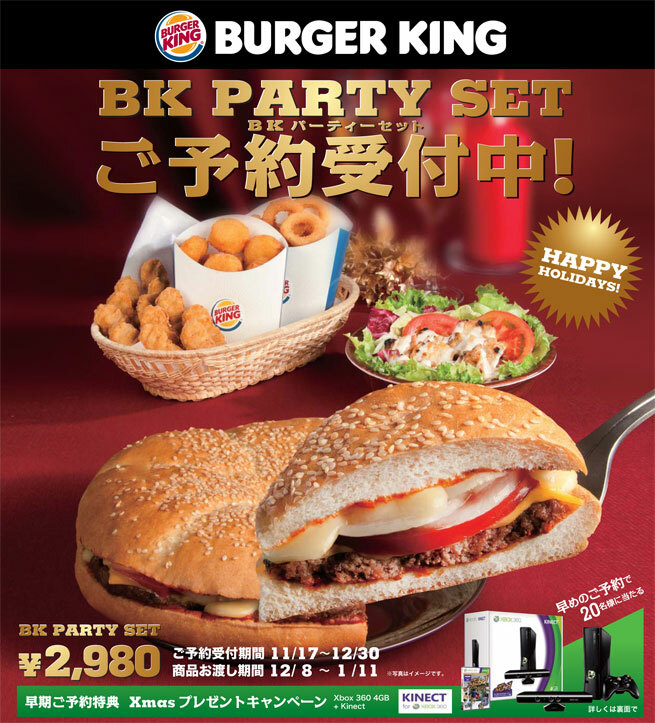 But rather than try to compete directly with Kentucky Fried Chicken (which would probably be a futile attempt since if Japanese people don’t prepare their own X-mas dinner they almost inevitably have chicken from KFC), Burger King Japan is offering a “NY Pizza Burger Set” as their holiday set. The huge Pizza Burger (which meant to shared by six or so people) can be ordered 単品 (singularly, without the “set”) for ¥1,680. Or a single burger “slice” can be bought for ¥320. But the entire “Holiday Set” can be purchased until 2010 December 30th for ¥2,980. This set comes with one Pizza Burger (serves six), a salad, an order of “BK Chicken Tenders”, an order of “BK Cheese Bits”, and an order of onion rings. 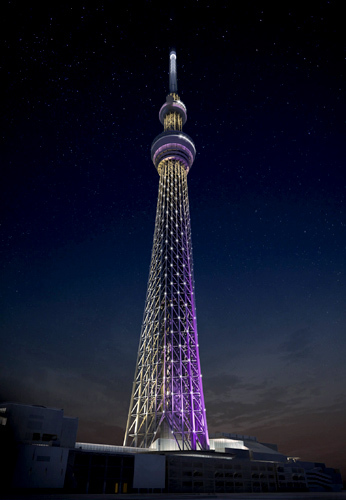 The 「東京スカイツリー」 (“Tokyo Sky Tree”) tower will stand an incredible 634 meters tall once it’s completed next year and every evening it will be illuminated blue and purple on alternating nights (blue one night, purple the next, and so on). 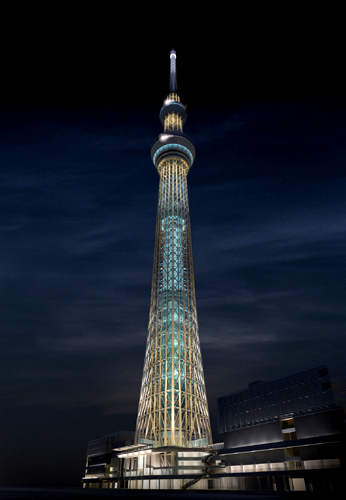 What the Tokyo Sky Tree will look like illuminated in blue, once it's completely built. 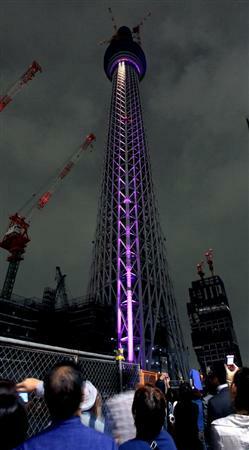 What the Tokyo Sky Tree will look like illuminated in purple, once it's completely built. Well, as I wrote in this comment I made last Saturday, the Tokyo Sky Tree was illuminated in both blue and purple from 6:30PM until 9:30PM tonight in a test run of the LED lights that will be used to light up the tower every evening once it’s done being built. As expected, many people turned up with their cameras to see the Tokyo Sky Tree light up the night sky for the first time (and only time until next year). The Tokyo Sky Tree lit up in purple tonight.